Summer is just around the corner and we bet many of you are busy making plans to enjoy the great outdoors by camping this summer. Most of you will return from your camping trips with just good memories but inevitably some outdoor enthusiasts will be nursing aches and pains come Monday morning. Each summer without fail some patients of Leduc Physio will come into the clinic after a weekend camping nursing a back or neck injury. This month we would like to share with you some tips for avoiding these minor but annoying injuries so you can focus on having fun. Most of us don’t have the luxury of bringing along our comfy mattress on a camping trip but that doesn’t mean you can’t employ a few strategies to keep your back happy. If you are camping in a trailer or camper make sure you have a supportive mattress installed. Choosing a mattress is a very personal decision and some considerations include your preferred sleeping position, whether you prefer a soft or hard mattress and what compromise you must reach with any sleep mates. Recent studies indicate that people who sleep on a firmer mattress tend to experience less back pain. Just because you are sleeping in a tent doesn’t mean you can’t make it easier on your back. Pack something soft like a foam sleeping pad to provide you with some cushioning and support. Other options that may bring you more comfort are a memory foam mattress topper, an air mattress, an inflating sleeping pad or even a camp cot if you have a bit more space. If your camping aches are more related to neck pain then bring along your favourite pillow so you can minimize potential problems. If you are a side sleeper then you will need a thicker pillow; ask someone to look at your sleeping position from behind. Your head, neck and spine should all be in one long line; if your head is tilted up or down then it may be time for a new pillow. If you are a back sleeper then choose a pillow that is less thick – again if someone observes you from the side then your head, neck and spine should be in a neutral position. People who like to sleep on their stomachs will need an even thinner profile pillow. 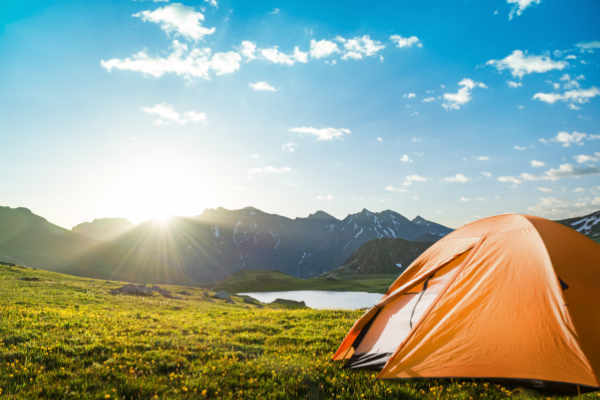 If you are experiencing any back or neck discomfort and plan to do a lot of camping this summer then plan to come in for an assessment before the outdoor season gets started. Your therapist can evaluate the cause of your pain and give you an individualized treatment plan to get you on the mend before you head out camping. Remember to ask your physio to evaluate your sleeping position and give you suggestions for stretches or other techniques to minimize any discomfort should you wake up sore. Call us at (780) 980-5443 to schedule your assessment!